When French du Puy Lentils Find Themselves In A Texas Kitchen….. The past few days here in Texas it has been chilly, rainy and absolutely wonderful. In fact it was so cold yesterday that we set a record low, high temperature and there is a good chance we will do the same again today. I even heard the weatherman use the word Polar Vortex today!?!? Is this global warming at work when it’s colder in Texas than in London, England in July? This is weather we normally don’t see until October here in North Texas and I love it! Ever since then I try to add beans and legumes to my diet as often as I can. First I replaced the traditional French sausage with my favorite smoked jalapeño sausage from Fredericksburg, Texas. Second, I add 2 jalapeños and 2 cans of original Ro-Tel (diced tomatoes and green chilies). Third, I add in traditional Tex-Mex spices like, cumin, chili powder, Mexican oregano, and cayenne pepper. Lastly I serve this spicy and hearty soup in big bowls with Texas Cornbread. 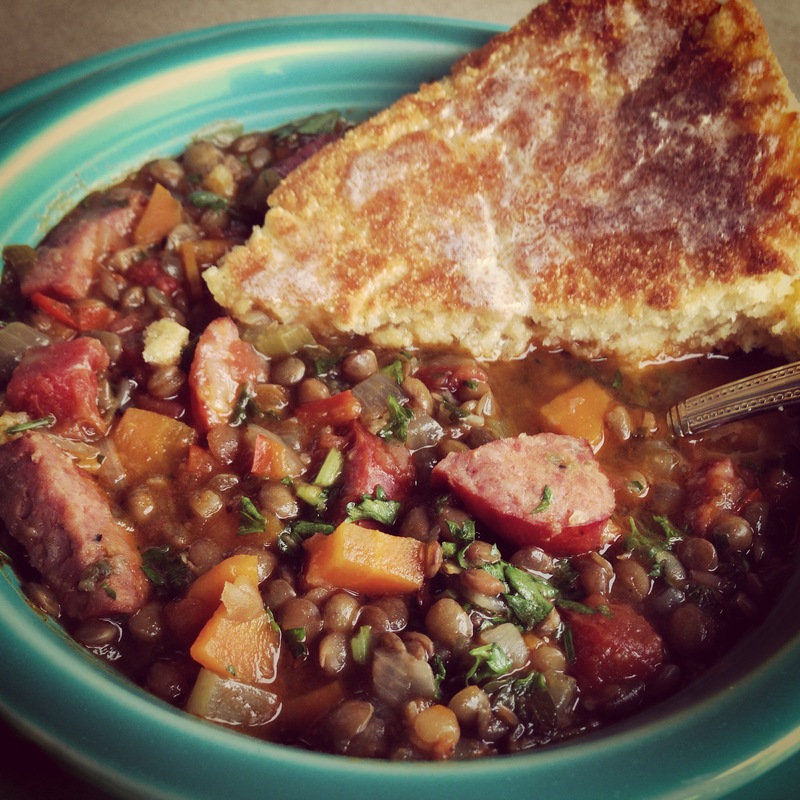 And let me tell y’all French Lentils, Texas Sausage and Cornbread is a match made in heaven! This recipe for Texas Sausage and French Lentil Soup makes enough to feed 6-8 people and it freezes beautifully so you can keep it on hand for those busy weeknights when there is no time to cook. I hope y’all enjoy and let me know what you think. In a large bowl, cover the lentils with boiling water and allow to soak for 15 minutes. Then drain. In an extra-large pot over medium heat, heat 3 Tablespoons of Extra Virgin Olive Oil. Add the chopped onion, carrots, celery, jalapeños, 1 teaspoon of kosher salt and a pinch of black pepper to the pot. Sauté the vegetables for 10 minutes or tender. Add in the grated garlic, the Mexican oregano, chili powder, cumin, and cayenne pepper. Sauté the spices and garlic for another 2 minutes or until the spices become fragrant. Add the 2 Cans of Ro-Tel (or preferred brand of diced tomatoes and green chilies), 4 cups of Chicken Stock and 6 Cups of Water to the pot and bring to a boil. Once boiling, add in the drained lentils and reduce heat to a simmer. Simmer for 45 minutes, checking every 15 minutes to see if more water needs to be added. After 45 minutes, check the seasoning and add in the smoked jalapeño sausage and the chopped flat leaf parsley. Simmer for another 15 minutes. Serve in big bowls with Texas Cornbread. Mel’s Spicy “Green” Pulled Pork Tamales, The Dallas Cowboys and a Doctor Who Marathon…. Looks incredible– we lived in Spain for 12 years and ate a similar lentil stew. yumm!